Hi friends! I know it's been a little bit since my last post but there's no denying that this can be just a busy time during the semester. I seriously can't even believe that Spring Break starts on Thursday - and once we get back there's only six more weeks until the semester! Since it has been a while since I last talked to you guys, I figured I would just give you a brief update on what's going on with me! 1. Like I mentioned, Spring Break starts on Thursday for me and I will be going to MONTREAL with one of my best friends, Julia! I'm not exactly sure how we decided on Montreal but we are both still SO excited to go! We're meeting up with some of Julia's friends and spending our time exploring the city! From what I hear, there's a ton of French influence so I already know I'm going to love it! If you have any recommendations for things to do/see/eat in Montreal...please let me know in the comments! 2. On Friday, I had the absolute pleasure of job shadowing a University of Richmond alumna at Tuckernuck! They are one of my favorite brands - I would honestly wear everything they have on their site! It was so amazing and inspiring to see all the hard work and team work that goes on to make such a great company like Tuckernuck possible! If you haven't checked them out, I recommend that you do! I just ordered these adorable sunnies! 3. In other exciting news, I recently found out that I am going to be studying abroad in the Netherlands next semester! I am SO excited about studying abroad and despite all the nerves that I already have, I really think I'm going to have an amazing time! 4. The picture from above is from when my friend Lauren and I met up with a another Richmond blogger, Stephanie of She Saw Style. One of the best things about blogging is definitely getting to meet all the blog/instagram friends IRL. We had so much to talk about and it was great to hear different perspectives about blogging and networking! 5. 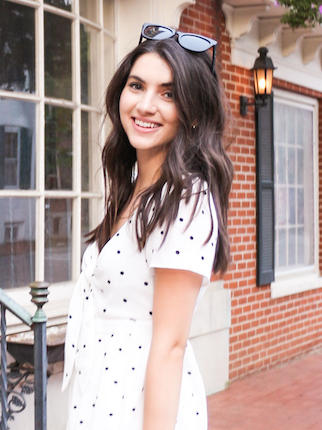 As you may know, I do blogging for a local boutique in RVA, Mod&Soul! I've posting over there about spring styles and new arrivals that are in store! One of my personal favorites is this off the shoulder top! What are your Spring Break Plans? Let me know in the comments! That is so cool that you got to job shadow at Tuckernuck. Such an amazing brand. And I agree...so many things I would wear. It was such a great experience! But not too great on my wallet because I wanted to buy everything!